Letters based on Victor Vasarely's work. Info: Created on 5th May 2011 . Last edited on 18th April 2014. @neurone error: Thank you. I don't remember exactly. I started to build this last sunday, and tested several versions. But the concept is much earlier. Anyway, you were right about something. It looks very simple, but I could not built it without some custom-made bricks to get the right proportions. Vasarely was born and educated in Hungary. Several of his works, including the famous Zebras, are on public places in my home town. It's not the better font for the insomnia nights, but it's a brilliant idea and a brilliant font. Like my "zlabyrinth", I go to use it in my teaching work with primary school kids. They must discover (really their eyes) the patron tath makes each letter. I like it so much. I tell you about the results. Sorry, I did not say "If you will permit me it, sir." My favorite element of this design is how the rotated tiles articulate the diagonal strokes of your bitmap primitive. In the case of Q, a potential flaw of the bitmap design (two one-pixel strokes crossing to create an ambiguous four pixel grouping) becomes a startling, singular, and totally lucid detail. I can easily see now the two strokes crossing each other! It is especially interesting to compare with % which contains the same formation of four pixels, but here the pinwheels look like loops instead of crossing lines. Hands-down favorite character on display: your kinetic asterisk. P.S. I wish we had an official way to favorite individual glyphs. What an inspiring, informational, and otherwise interesting display this might lead to. When we push Zoom slider to Max and Fullscreen, it really gives a headache. You surely found the perfect ratio for the op effect. As for your famous op-art predecessors from the 60s-70s, you often manage in in some of your most succeeding works a subtle and difficult equilibrium between Art and Science. Congrats. Rectification : think it can give headache at any size. Amazing ! I've made some changes, extended the character set. Unfortunately, I could not accommodate diacritical marks at this grid size. The wide black margins have been removed. For single letters they were to enhance the contrast, improve the visual impact. However, they were too distracting for text, even for short sequences of glyphs. I hope you like the new version. I've made another demo pic (above). For Fontstruct, it is my first GIF animation, actually. No big deal. Previously, I tried to animate the Waves , but fluid undulation effect just was not there. This one works like a clock, showing the full seconds. There is a tiny wobble I could not eliminate: the top and the bottom row of squares jumps a fraction of pixel at some frames. Thank you for your comments and generous ratings. @elmoyenique: So you want to show it to your students? Great idea. Please, do. You don't need my permission, it's free to use. You can take the GIF too, with the numbers. Yes, tell me about the reactions, please. @will.i.ૐ: Thank you for your comment. 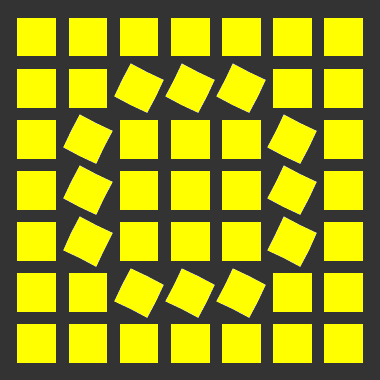 The rotated squares are not exactly the same size as the aligned ones, but they are close. The diffence is approximately 3.5%, and having the rotated squares a bit smaller, actually serves as optical adjustment. I've spent a whole afternoon to find the right formula experimenting with filters and composite bricks. It should not have to be perfect, but good enough. of squares would help, but at what cost? Small size and simplicity matters. I also tried to make an inverse (black squares on white) version, only to realise it was not feasible with the current FS tools. Only a third kind of "opposite" made it: the rotated squares in the lower case are leaning to the opposite direction. Some diagonals benefited there too. A gallery of favorite glyphs: good idea. In many cases a single glyph outshines the rest of the pack. @Frodo : This headache remark was a compliment, a humourous way of telling you that the new version without the black margins was better, in my opinion, had a stronger effect. @neurone error: I'm sorry, I completely misunderstood it. In this case, thank you for the compliment. I'm glad you like the new version. For you this experiment with coloured diagonals. Added also an effect that dissolves a bit the squares. I didn't center the background voluntarily, found it gave a sort of "moving" sensation. You can hide it if you don't like. Congratulations! FontStruct Staff have deemed your FontStruction worthy of special mention. 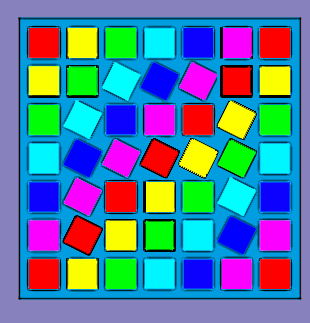 “Vasarely Squares ” is now a Top Pick. Congrats por este merecido TP. (I'll tell you at soon about my work using your glyphs with the kids. I've started today with 7 years old childs). I'm with will.i.ૐ and meek. I like it. It must just to try it. I'm with will.i.ૐ and meek. It must just try it. Sorry. The last line ought to be deleted. @meek: Thank you for the special mention. @neurone error: I'm glad you liked my font, and played with. Nice distorsion effect. @elmoyenique: Thank you. I look forward to hear about the results. Very nice work, Frodo7! I sent a private message. Awesome! Great way of thinking!